In order to access the effectiveness of the web designs, we must first determine a general definition of “effectiveness.” In this case, and especially for this genre, delivery of accurate and specific information about the program(s) of the nonprofit are a top priority. Unlike a portfolio or e-commerce site, where design may decide between success and failure, here, an audience may be much more forgiving as long as they can easily gain a clear understanding of what the organization does and how they do it. 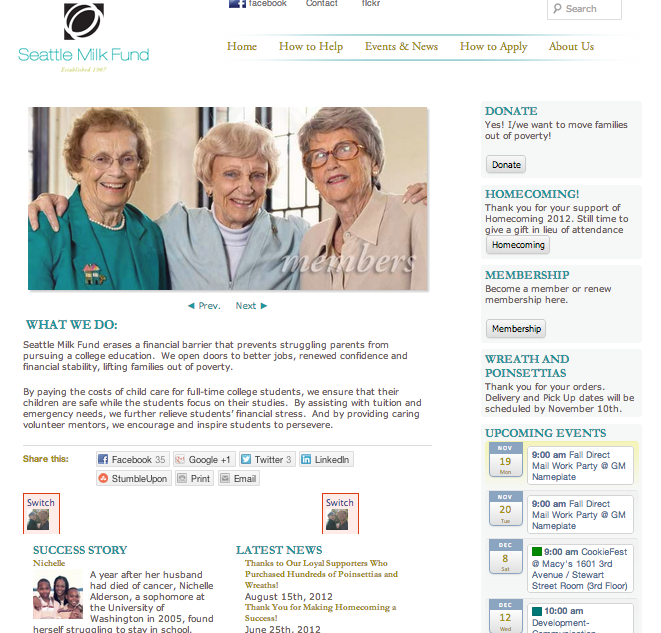 Seattle Milk Fund conveys what they do clearly enough, especially via their top nav bar. Though they have a wide variety of social media sharing options, they are poorly organized and not well placed, so there is much room for improvement there. Information on the site feels randomly placed and does not follow any coherent logic. Overall, we would rate this site as Average. Sound Experience provides a good deal of visual information, but the way their site is laid out, it’s not very easy to tell exactly what it is they do. It appears that they feature the most recent post first (blog-style), which doesn’t provide the average (or first time) visitor with enough context to grasp the purpose of the org. Top bar nav is helpful, but the rest of the information architecture does not seem to follow any discernible pattern. Lastly, social media integration is there, but it’s general to the org and not specific to the post/content, which we think makes a big difference when it comes to shareability. Below Average. 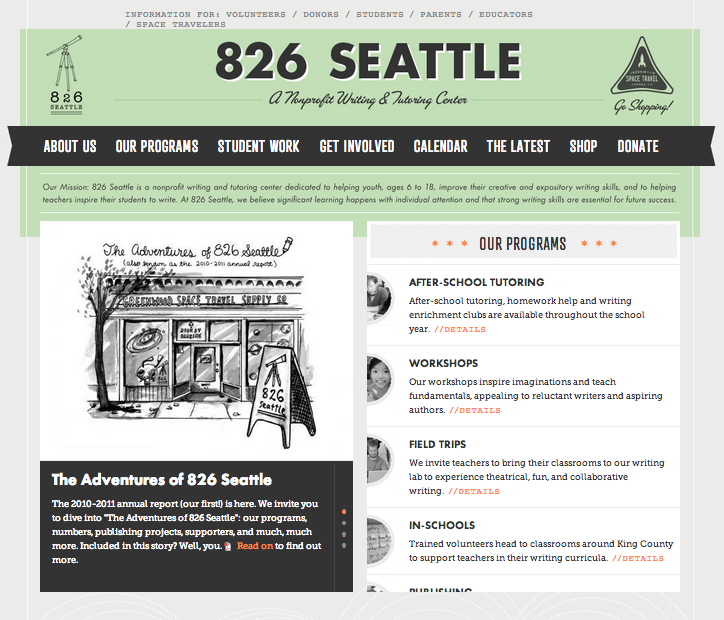 826 Seattle has the strongest design among the three sites that we reviewed. It’s well organized, clear about what the org does (and how they do it) and there are multiple, easy to access call-to-action buttons throughout. It’s actually enjoyable to explore and the tone of the copy seems to reflect the style and personality of the org. The one shortcoming is in their social graph integration. The only options to connect to 826 Seattle via social media are located at the very bottom of the front page in colors and styles that do not lend themselves well to discovery. 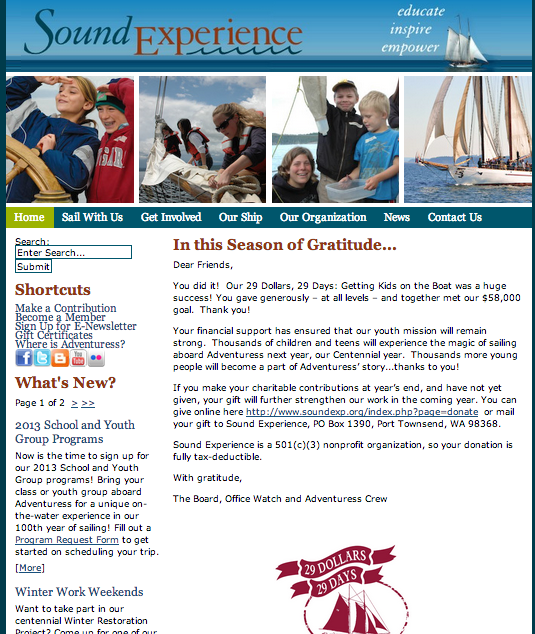 Otherwise, an excellent example of a site built on WordPress. Exceptional. Ann is a 34-year-old, stay-at-home mother who has two children aged 10 and 8. Her husband works in the digital media industry, and they live in a house in Ballard. She leads an active lifestyle and is passionate about education and her neighborhood and community. Ann is looking for prospective after-school and weekend activities for her two children, aged 10 and 8. She read about a few nonprofit organizations on a mom blog and thought it would be worthwhile to take a look at their websites to see if any of them might offer activities that would be a good fit for her kids OR if her and her husband might find a way to get involved to support the nonprofit’s efforts through volunteering or donations.